Running in Doha, Qatar. Best places to run in Qatar. 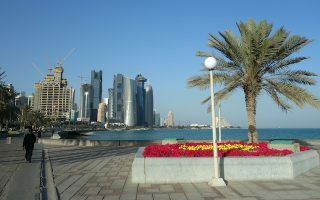 Doha is the capital of Qatar, a small country on the tip of the Arabic Peninsula, surrounded on three sides by the warm waters of the Persian Gulf. With large oil and gas reserves, Qatar is home to a high powered economy, with expatriates and travelers filtering through its airport at a rapid pace. 50% Qatar’s population lives in Doha. There is some spectacular scenery for running in Doha, between Gulf views, dramatic skyline, and the surrounding Arabian desert. 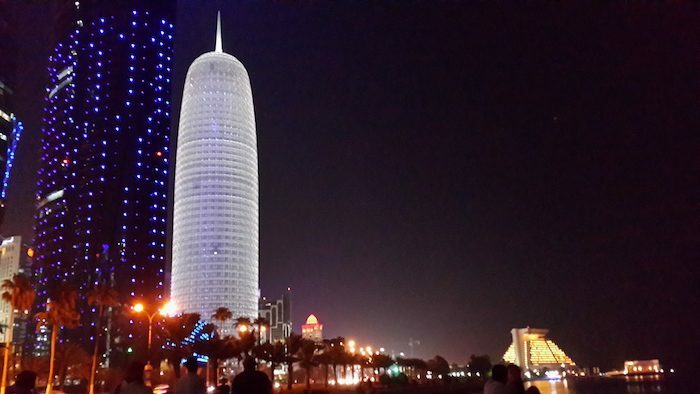 The best bets for running in Qatar tend to be along the dedicated paths and parks. Roads are wide, with heavy traffic–though there are sidewalks. 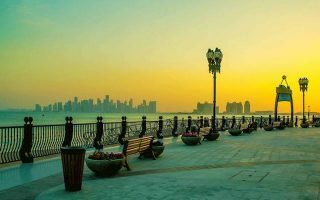 The most popular running route in Qatar is out along the Corniche, the paved crescent that follows Doha’s coast. The Pearl, a $15 billion artificial island north of the city, also has its own paved path along the water. There are also some great park routes around the city, including Aspire Park and Oxygen Park. For those who’s like to experience the challenge and drama of running in the desert, there are companies that organize expeditions. While there are buses in Qatar, they are not widely used by tourists. Most visitors rely on taxis or hired cars to get around. The beauty of these running routes is that are situated close together, and if you’re staying downtown, you can hit them all during one visit. Notes: Be knowledgeable about cultural sensitivities when running in Qatar. The Doha Bay Running Club has some good advice on the subject. Also, be aware of the heat. 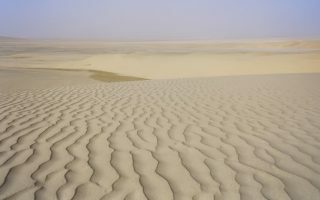 Summers especially are hot, windy, and humid, with average high temperatures in the 40c (110F+). The signature run in Doha. Promenade along the Gulf with dramatic water and skyline views. It's 5 km from the Sheraton Hotel Park to the Museum of Islamic Art, with add-ons out to the port or another 1.5 km to the Qatar National Museum. 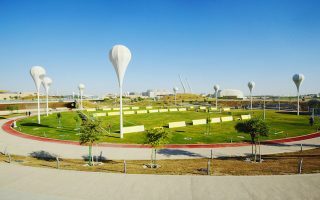 Aspire Park is your best option for a park run in Doha, with its own set of designated running trails (the longest loop about 5 km) around Aspire Lake. The looping 1 km running track in Oxygen Park may be short, but as it dips through tunnels, up hills, and under the glowing balloon lights, it adds an element of surprise and excitement to your run. An artificial island, built as a rounded neck jutting out into the waters just north of Doha. Good running out to Bahriya Beach, along sidewalk following Pearl Blvd. and Porto Arabia Drive. Can also run along narrow path to Isola Dana. For a truly one of a kind running experience, you may want to consider heading out to the red sands of the desert, about an hour outside the city. This is a hot, desert climate. Summers are brutal: hot, windy, and more humid than one would think for a desert climate. Please use caution when running in summer, as average high temperatures average over 100F (38C) from May-October and 42C (107F) in July and August. Summer nights do not cool off, with averages low 30s (86FF). Winters are much more pleasant for running, with high temps in the mid 20s (70-80F) and nights that dip into the teens (50s). Precipitation is relatively rare. Do be aware that dust storms can occur. 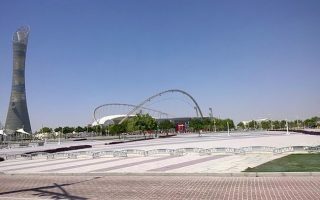 Olympic Sports and Sports Corner are the go-to shops in Doha. Doha Bay Running Club is a terrific group and a good resource for running in Doha. Group Runs: Fridays, meet at Qatar Sports Club car park, in front of 1882 coffee shop. Info. Qatar West Coast Hash House Harriers hosts group runs. Find a list of upcoming races in Qatar here.